There's nothing better than cracking open a new issue of Game Trade Magazine and finding out what Steve Jackson Games stuff you should look for in the coming months. Well, maybe one thing better – free Steve Jackson Games swag! The October issue of GTM (also their 200th issue – congratulations!) 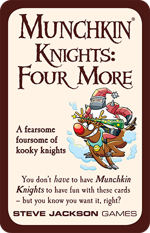 features a mini expansion, Munchkin Knights: Four More, for free. That's zero, zilch, nada dollars. Plus, the magazine itself is free! You can't beat free, and you definitely can't beat double-free. (I've tried.) In the pack, you'll find four knights to battle, like the Silent Knight. Santa's quiet little helper is ready to add you to his naughty list. Don't keep a lot of equipment on you or Sir Plus will punish you for it. One Knight In Bangkok puts the knight back into chess, and make sure you have a calendar on hand if you're battling Weak Knight. You can pick up GTM free of charge at your friendly local game store. 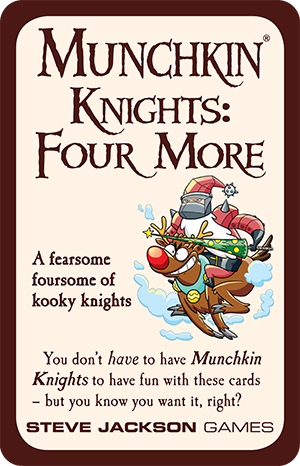 You can also have your squire grab the full Munchkin Knights!